Although Jon Anderson has been recording and releasing solo material since 1976, it took until 2005 for a video of him performing solo to be released. 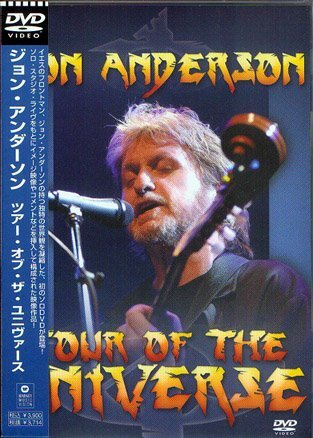 I was expecting a normal "live" album when the DVD, Tour of the Universe, was released here in the USA in the fall of 2005. 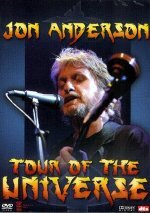 However, it is a mixture of live (focusing on Jon almost exclusively), video editing and effects, great sound and "promotional material" for XM Satellite Radio, who sponsored this DVD released. It's not a normal live recording at all. Having said that, it is an enjoyable recording, and includes Jon's covering of two Jon and Vangelis tunes: "State of Independence" and "Change We Must". The material comes from his "Tour of the Universe", and he certainly is a cosmic man. What a great voice he has, even after all of these years. Did I mention that the disc sounds great? There is a DTS audio track here, and it is put to good use. Region 2, NTSC, 16:9, DTS and Dolby 5.1, promotional marking on disc "SAMPLE - LOANED"